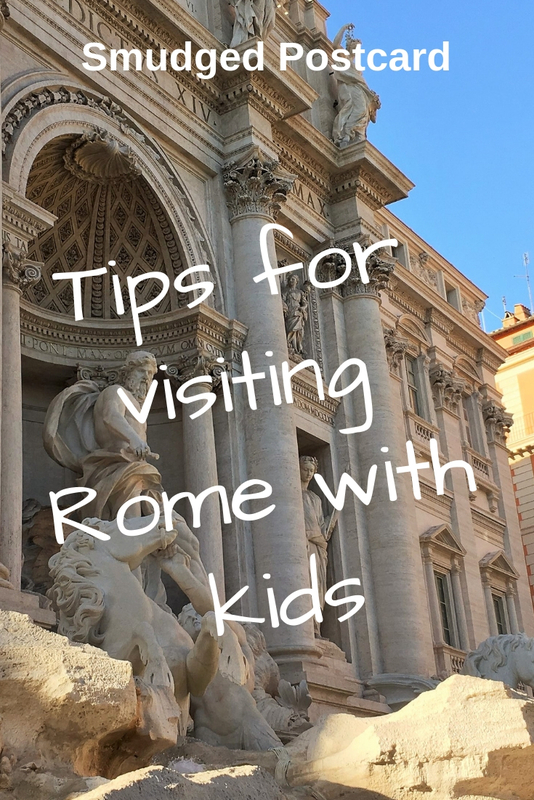 Would you visit Rome in the summer with kids? It’s hot, it’s packed with tourists and most sane Romans have skipped town in favour of the coast. So it’s not a sensible place for a family day out with small children. But this summer we went anyway. 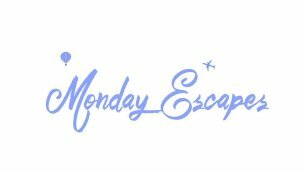 We had friends near Rome to visit and a few days to spare at the end of our summer holiday in Le Marche, so we decided a leisurely day in the capital might be a bit of fun. We’d pop in, have a quick look at the Colosseum, visit a piazza or two, have a nice meal and then escape back to our agriturismo in the nearby countryside. We’re seasoned travellers, we’ve been to Rome before. How hard could it be…? Really very hard as it turned out. We were then foiled in our attempts to take the nearby metro line due to engineering work which forced us to take a replacement bus through the suburbs into the centre of Rome. Our journey, which should have taken half an hour, ended up taking two. It was very much an immersive experience into the life of the Roman commuter. 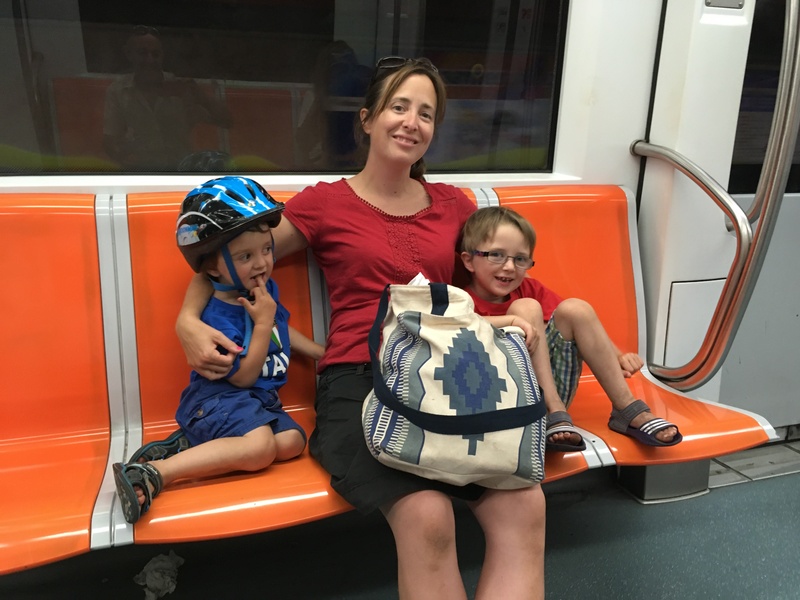 Our boys, however, have fond memories of the myriad modes of transport we took, the various train stations we passed through and the general adventure of travelling. It wasn’t just hot when we visited Rome at the end of July, it was headline-grabbing, heatwave hot. It was so hot, I thought my brain might melt and I was unable to make even simple decisions. It took all of my mental energy to get the kids across a road safely or find somewhere suitable for lunch. Lunch next to a tram line: perfect for transport enthusiasts. Strangely, the children seemed completely unfazed by the temperature. They drank a bit more than usual but that was it. My kids have always looked at these ridiculous over-priced tourist traps in London and asked why we can’t go on one so we decided to treat them in Rome. However, the bus was hot, incredibly bumpy and stupidly expensive. We only “hopped” on it three times and I worked out that it would have been cheaper to pay for three taxi rides rather than buy tickets for a family of four. It also didn’t quite take us to the places we wanted to go to and didn’t really keep to its timetable. Obviously, the children loved seeing the sights of Rome from the upper deck and the bumpiness was so therapeutic that my three year old actually fell asleep. 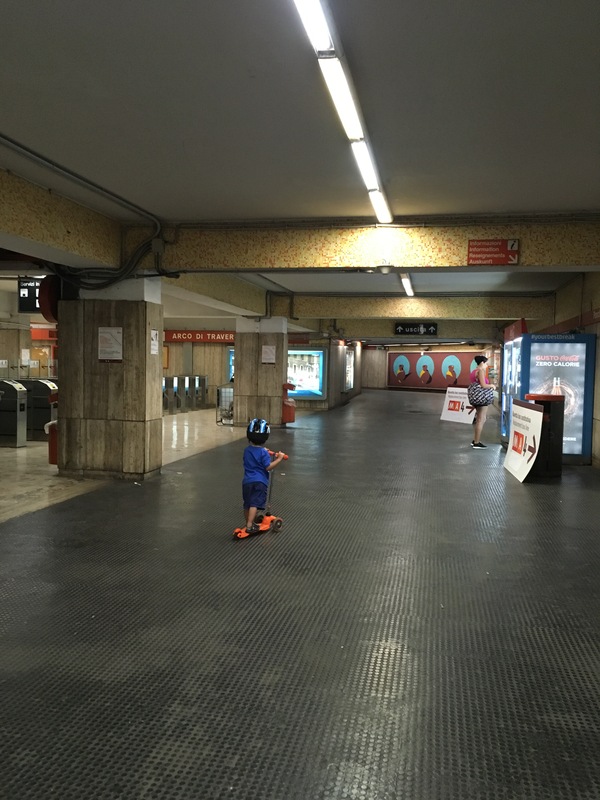 Our three year old can spend hours exploring a city provided he is on wheels: ideally a scooter or a bike. So we decided to bring his scooter with us to Rome. Unfortunately, we discovered on arrival that scooters are not allowed into the Colosseum (unlike the historic sites in Sicily where no one bats an eyelid). The heat was so intense and the shade so non-existent that we decided we couldn’t bear looking for somewhere to store the scooter and decided to pass on the Colosseum. Rome in the summer with kids: too hot for photography, this is the only shot I took of the Colosseum. The boys took this surprisingly well (I was gutted on their behalf). In fact, when I ask my six year old now what he enjoyed most about Rome, he says it was the armoured vehicles guarding the Colosseum and the line of soldiers with machine guns. This activity nearly didn’t happen as we hadn’t thought to bring our passports with us. I was concerned about breaking more bad news to the kids when the owner of one of the buggies decided that the blurred copies of our passports which we had miraculously found attached to an old email on my phone would suffice. The Villa Borghese Gardens are shady, peaceful and full of young lovers lounging on benches. The gardens are the perfect place to hide from the heat if, like us, your only free day to visit Rome is a Monday when half the museums are shut. We drove around, admired the lakes, the views and the villas. We ate ice creams and relaxed. The day picked up after this little interlude. Determined to tick at least one child-friendly Roman attraction off our list, we headed to Rome’s most famous fountain, along with, of course, every tourist in the city. 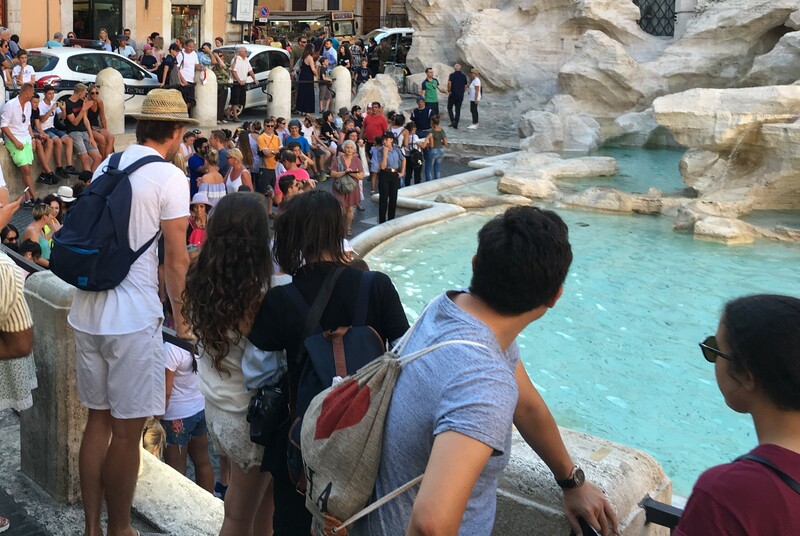 I’d seen the Trevi Fountain a few times but never had I seen it so utterly overwhelmed by visitors. There was a policewoman on duty whose sole job was to blow a whistle, glare, and point a finger at anyone who dared so much as brush their clothing within an inch of the fountain. Obviously tossing a coin over your shoulder at this travertine masterpiece is absolutely fine. The boys thought the policewoman was hilarious and we eventually found a comfy spot to sit and watch the poor woman haranguing the unsuspecting tourists who strayed too close to the fountain. 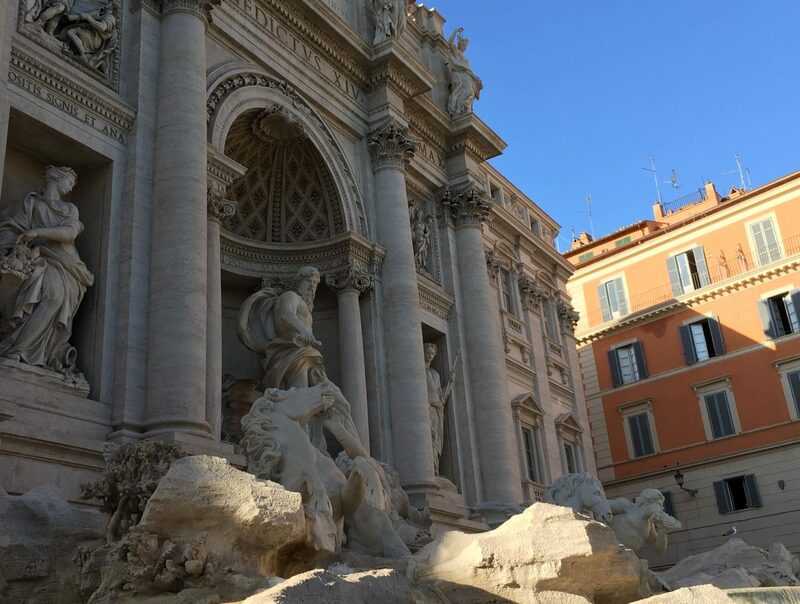 A tough job: policing the Trevi Fountain. As the heat of the day receded we were able to amble from one tourist hot spot to the next along Rome’s now-shaded streets, which was fun. The children enjoyed racing up the Spanish Steps, and back down again. There were more soldiers with big guns. We bought t-shirts and postcards. 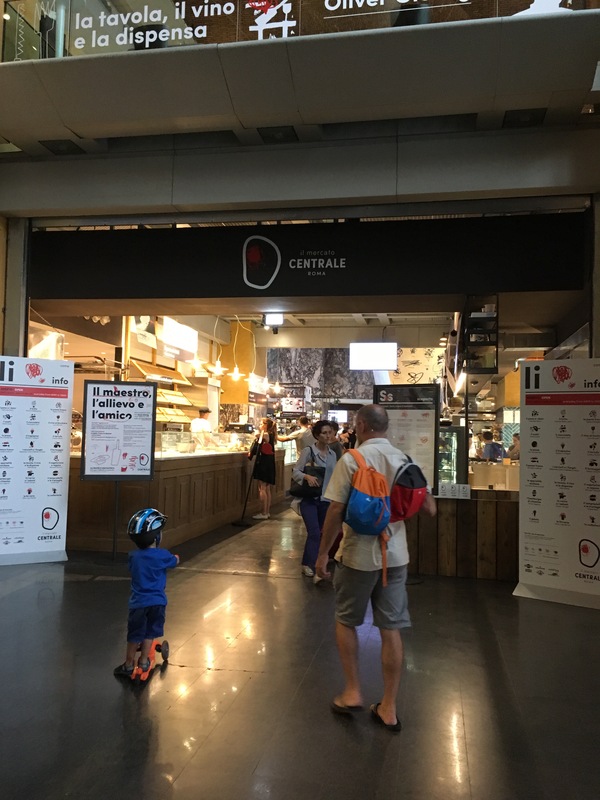 We had an excellent evening meal at Mercato Centrale at Termini station. The journey home was a bit of a drag (a bus, a metro train, then a car) but we survived. As the children had no expectations as to how the day would unfold, they found the whole experience a fun adventure. We as parents were rather lucky that the children viewed the day in this way. So, how would I do things differently next time? Well, I’d drink my morning coffee a little more hastily. Definitely no bus, perhaps a guide – in a car. No scooter. And I think our next visit will be in wintertime. 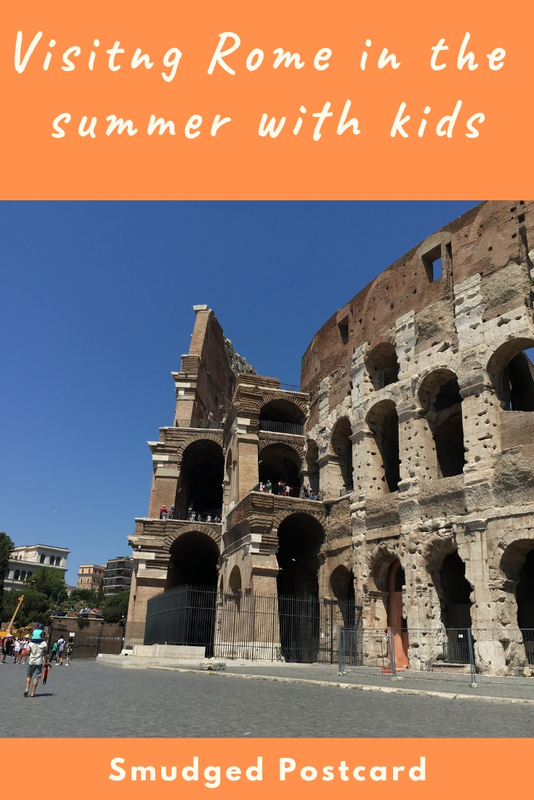 Have you visited Rome in the summer with kids? Do you have any similar travel experiences where things have not gone to plan? Or where you failed to formulate a plan? Let me know in the comments below. Even if you’re relaxed when it comes to planning, a modicum of research is useful. Sight see early in the morning or late in the afternoon and find a restaurant and/or museum to while away the hottest part of the day. If possible, don’t go on a Monday: many attractions are shut including the excellent Explora children’s museum which would be an ideal place to shelter from the midday sun. Consider using a taxi for some of your travels across the city, it can be money well spent. Check what you’re allowed to bring into each place. Security is much tighter than it used to be. Plan to only see one or two attractions, you can always add more on the day if you have the time or energy. You don’t need to bring lots of water with you: there are many drinking fountains (nasoni) throughout the city to fill up bottles and lots of people sell bottled water outside the main attractions. Eat lots of ice cream. I’m glad my sons have happy memories of it! Yes, it started badly but turned out ok in the end. A useful learning experience for us complacent travellers! Yes, gelato is essential! 9 days is impressive but there is so much to see and do isn’t there? Yes there is SO much to see and do, we never even came close to checking it all off our list! February sounds like a much better idea! Yes, you forget how much kids can learn just from being somewhere new. Maybe I’ll just take them to Birmingham next time! Yes, we love Rome too and so do the kids despite the crazy day we had, they’re so resilient! Yes, I was surprised by how well they tolerated it. We didn’t make them walk anywhere until about 5pm so that helped! 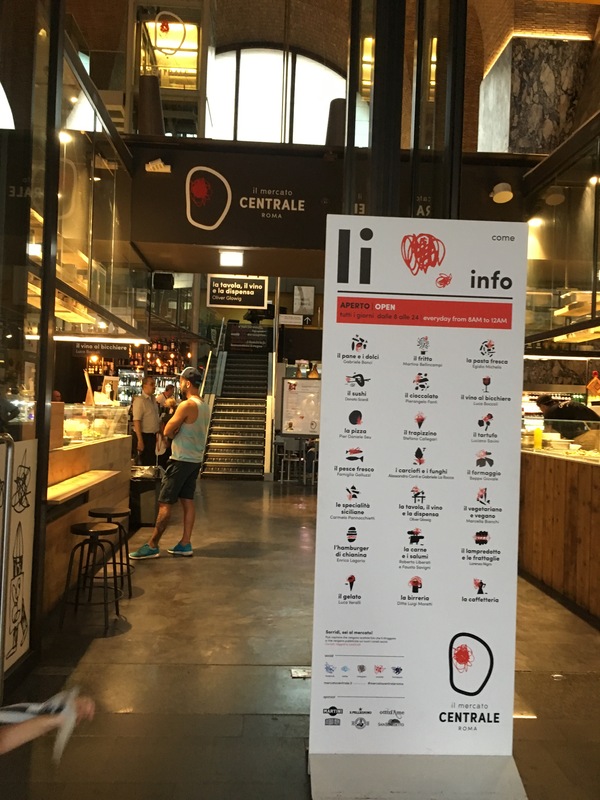 It sounds like you coped quite well – thank you gelato. It’s often luck on the day as to how children will manage, we were very lucky that our kids were in a laid back frame of mind! I found Rome to be so family friendly when we went (besides the super busy roads!). We only took the one but I found the variety of food was just really good, especially with it being amazing pizza and pasta. I’d love to go back one day! I love Rome! I’d say my favourite European city, or thereabouts. Yes, it’s an amazing place, hoping to have a better trip next time we visit! Thank you so much for the tips I am cruising to Rome for the first time. Fortunately, it is not in the middle of summer which I have heard before the heat is torturous as described. We will l be going in September without children but I loved reading about what your kids thought of the whole experience! I think provided expectations are sensible and you take things slow, travel with kids usually goes pretty well! I expect Greece will be very similar to Italy. Best to visit sites at the very start or end of the day. The evening in Rome and Frascati was lovely. Rome is such an amazing city, even though it is way too touristic in summer! 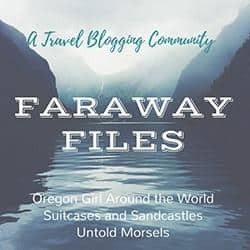 Your post is such a positive motivation for me: my daughter is 4 months old and it´s so great to see someone traveling with little kids and sharing useful tips about it! 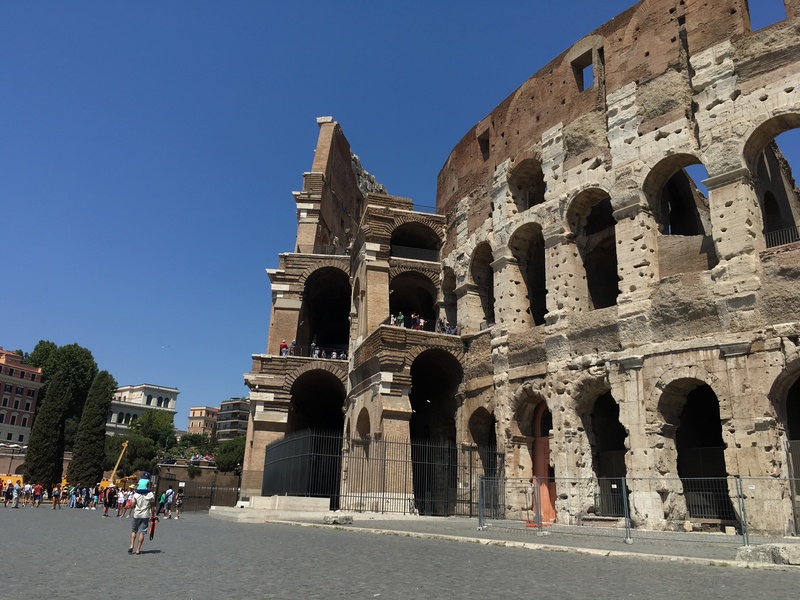 Bringing my kids – 9 and 11 – to Rome in two weeks. It will be their first time in Europe and I couldn’t be more excited for it! I have been there 3 times myself but I know this will be a very special experience as I will see Rome through their eyes! I’m sure you’ll have an amazing time. Perfect time of year to go too! we have been to Rome many times and must admit that summer is the worst time. I love going just before Christmas when there are no crowds and lovely choirs in the piazzas. Breakfast is always the hardest time of day for us! I’d love to visit Rome at Christmas. Italy does it in a much more tasteful way than the UK! I bet Italy will be pretty easy for you after India! I loved reading this! I love Rome but the heat and all the people is not expected sometimes!